Last time we had snow in Powell River we couldn't stay long enough to enjoy it. This time we got to stay at the cabin through the whole storm. Storm probably isn't the right word. It was a very gentle dusting, but it lasted for almost two days. I've grown garlic for two years. I don't have much space in my float garden, so I grow garlic in puts. I don't need much to last me for a year, so three small containers are more than enough. Garlic takes very little attention. Plant cloves with the growth point up, water, feed periodically, dig, dry, and enjoy. I purchase my garlic sets at the nursery. One small bag goes a long way because you pull the cloves apart and plant each one separately. Ideally, you plant the closes seven inches apart for lots of growth room. As you can see, I use smaller spacing in the pots. The bulbs don't grow as big, but are plenty large for cooking. When the tops start to brown, wilt, and fall over, it's time to pull the bulbs out of the soil. If the weather is dry, I leave them on the surface to dry. After the surface of the bulbs have dried, I brush off as much of the dirt as possible, tie the tops of half a dozen together, and hang them in a protected spot outdoors. This starts the preserving process. I leave them outdoors until the skin on the bulbs is dry and flaky. I trim the tops shorter and hang the bundles in the cabin's storage room. By this time there's no odour, and they're handy to grab for cooking. Hey Ducky, look over there. That looks like the tree we used to hang out under last summer, but now it's a long way from shore. What's up? What did you say Daddles? I couldn't hear you over all the roaring water out in the middle of the river. Now I see what you mean Daddles. Let me take a look down here and see if I can figure it out. Well Daddles, I guess all that rain and snow made our Willamette River home larger, faster, and muddier. That's the parking lots down there. I've been cooking for as long as I can remember. Mom and Dad both loved to cook and let me have lots of experience in the kitchen. Dad had his “secret sauce” that could become spaghetti, chili or anything calling for a meat and tomato base. Mom baked and tried lots of exotic recipes from the classes they attended together. Mom and I inherited our love of cooking from Great Grandpa Johnson who was Chef at the Glendale Sanitarium. The “San” was a health resort of sorts run by the Adventist Church at the turn of the twentieth century. Mom told stories of running up the hill from her grandparent's house to visit Grandpa in the kitchen. 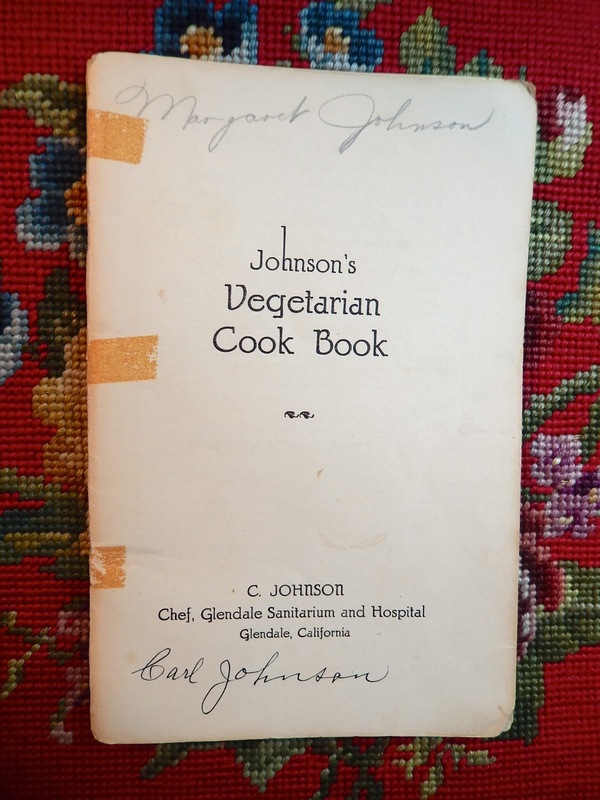 He even published Johnson's Vegetarian Cook Book. Here's a copy signed by my Great Aunt Margaret and Great Grandpa Carl Johnson, a Swedish immigrant. I am more of a dump and pour cook. 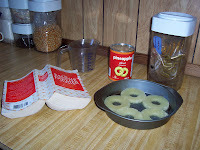 Most things I prepare don’t involve a recipe, but that doesn’t work well for baking. 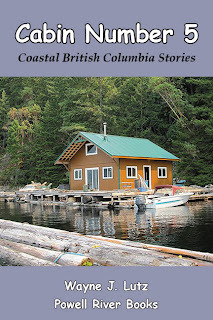 When we got our float cabin on Powell Lake, I wanted a good, comprehensive cookbook. 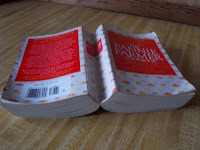 My choice was The Fannie Farmer Cookbook. It was first published as The Boston Cooking School Cook Book by Fannie Merritt Farmer in 1896. Mine is the 13th Edition by Marion Cunningham and illustrated by Lauren Jarrett (Bantam Books, 1994). It's in paperback and a steal at $7.99 US/$9.99 CAN. There are 1230 pages of all types of recipes, preparation techniques, general directions and measurement equivalents. The illustrations are an excellent resource when trying new preparation techniques. I'm always referring to it whenever I bake or want to try something different. Here's another picture from last week's snow up the lake. Where'd the sun go? And what's this cold cap on my head? 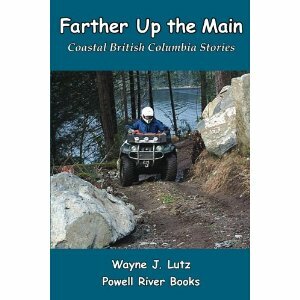 When Wayne and I tell people we live off the grid in a float cabin 12 kilometres (8 miles) up Powell Lake, they ask, "What do you do way up there?" We divide entertainment into two categories: cabin living and just for fun. Cabin living is its own entertainment. Wayne and I grew up in the city, so the big change is lots of fun for us. Cabin maintenance. Stay ahead of things and problems diminish. This summer we'll re-stain the deck and paint indoors. New projects. Our friend John does most of these, but we "assist." We are learning to do more on our own. We made a porch enclosure for outdoor meals in winter. Wood gathering. We gather and split wood in spring and summer to get it ready for winter. Our log splitter has made the whole process less work and more entertaining! I think of wood in the shed like money in the bank. Plenty of time is left for entertainment that's just for fun. Weather Watching. We're more aware of weather up the lake. Plus, Wayne has his "weather toys" to keep up with trends. Writing. Cabin life generates lots of stories, and a unique space for a Wayne to work on his books. I use the solitude to write grants for my consulting business. Reading. There's nothing better than a good book. 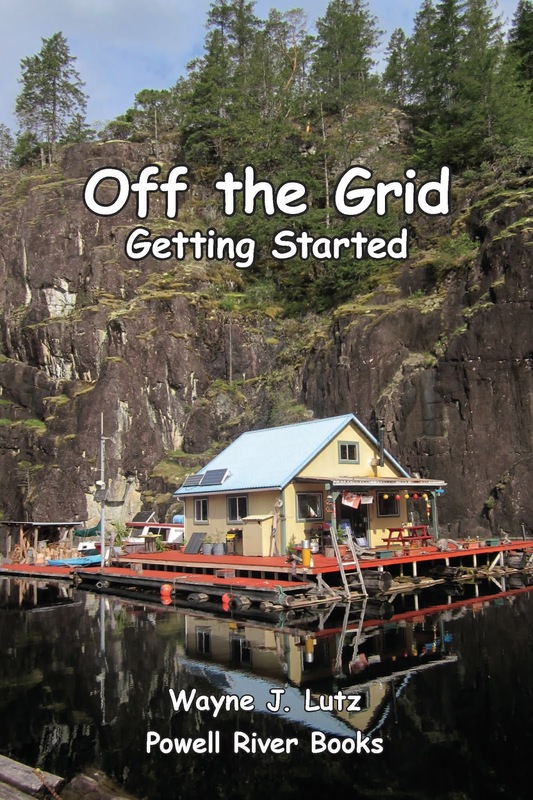 Rechargeable Kindles and Kobos are great for off the grid. Technology. Satellite radio links us to the world. We don't have TV or Internet, but enjoy laptop movies. Town visits let us surf the web, get email, and blog. Boating. 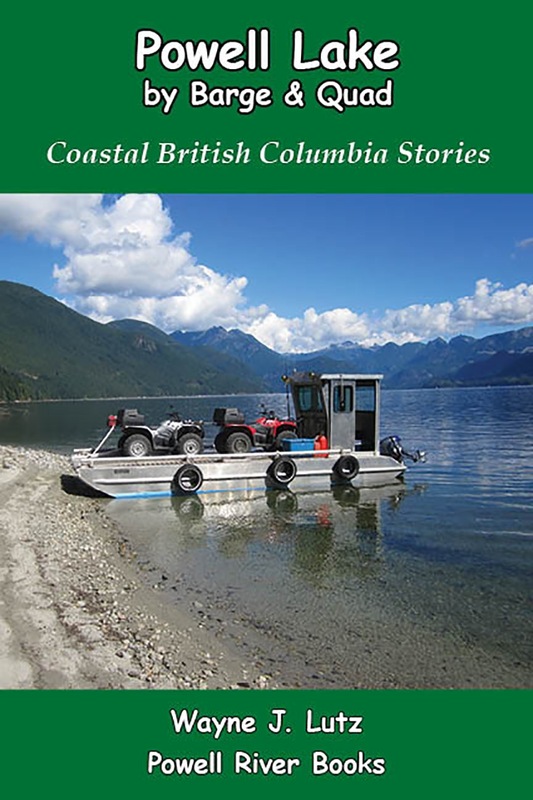 The cabin floats on Powell Lake, so there's lots of places to explore by boat and kayak. 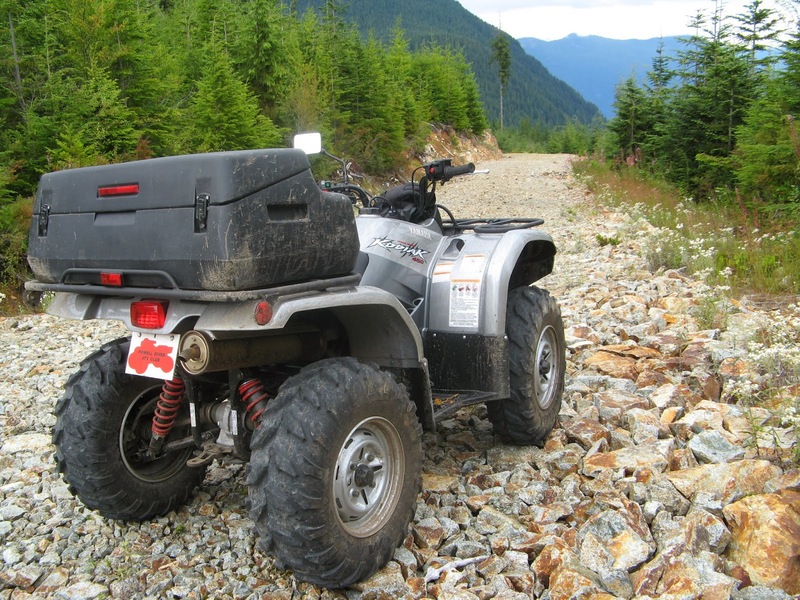 Quad Rides and Hiking. Loggers have built many roads to timber lots along the lake. On weekends or when logging isn't active these make excellent trails to explore. In winter, boots can be exchanged for snowshoes. Crafts. I like to decorate buckets, containers, and rocks with acrylics, and have taken up crocheting, a pastime my mom loved. Photography. I'm constantly taking pictures, especially to post along with stories on my blog. Gardening. My floating garden produces delicious veggies. My new find is curly kale lasts all winter for salads and soups. Cooking. Wayne's the BBQ chef year round. Winter is cooking time for me when I experiment with baking and meals using my new propane stove. Fishing. Whether it is from the cabin deck or trolling, fishing is fun. Every summer night fish tease us by jumping inside our log boom. But, oh, are they wily fish. Yesterday morning we woke to a gentle snow storm. It began at 2:00 in the morning and was still falling lightly when we opened the sliding glass door.